In the following Mishna that I learned (Yoma 2:2), there was a very familiar word - פיס payis, meaning lottery (more about words related to lottery in a few weeks.) A similarly sounding and spelled word is פיוס piyus - conciliation. Are the two related? According to Klein, not only are they unrelated, they are associated with opposite meanings. Let's start with payis. The definition of payis is a lot, an allotted portion. The literal meaning was "broken piece" - assumedly that's how they made the lots. 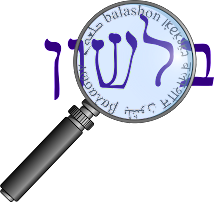 The word derives from the base פסס (a collateral form of פצץ). What other words come from this root? What about piyus? Klein explains that it is borrowed from the Greek peisis meaning persuasion, from the Indo-European base bheidh (or bhidh). That same base led to the Latin word fidere (to trust or confide in.) What English words derive from this root? Bid, federation, faith, confidence, fiduciary, fidelity, fiance, affidavit, and many more. So while payis is connected to breaking apart, piyus is related to coming together. By matter of complete coincidence, English has two words that also sound similar with the same opposite meanings, and even sound like our payis/piyus : piece and peace. But there's no connection between any of the four.